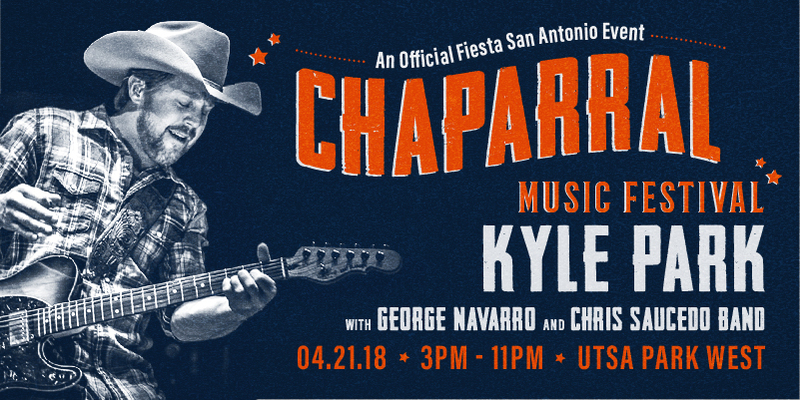 Chaparral Music Festival is bringing the spirit and culture of Fiesta to UTSA Park West, from 3pm to 11pm, and we’re kicking our heels with excitement! Join us for an afternoon and evening filled with Live-Country Music, featuring headliner and Texas Chart-Topper, Kyle Park! With special guests, George Navarro, Chris Saucedo Band, and our very own Country Music DJ playing all the best hits and favorites! The festival will also feature: Two-Step Dance Lessons! Local Artists and Merchants! Lawn-Games Galore! A Mechanical Bull! And of course, ice-cold beer and drinks, and lots of tasty-Texas-style food! All proceeds benefit the SA Parks Foundation AND the UTSA Alumni Association. Kids 12 years of age or younger are free.